The other day, I was thinking about what it is that makes autumn so wonderful. A little later that day, as I put root vegetables, acorn squash, and apples in my shopping cart, I realized that there is such a feeling of comfort during this season. No matter what the day brings, you can always find a comforting soup, warming cup of tea, a soft blanket, or a pumpkin-spice candle to lift your spirits. Another reason I love fall is because there is always something that need roasting, baking, or braising in the oven that was ignored all summer. I love turning the oven on first thing in the morning when the air is cold in preparation for a day of baking or roasting. Even without knowing exactly what I'm going to make, I set the temperature to 350 F and find something to set on the middle rack. Today, I roasted a pumpkin to make some puree now that the grocery stores are filled with sugar pumpkins. I love buying 3 or 4 of these little pumpkins to set on the table or in a window sill for decoration. Then, I use them as needed and replace them with things like bowls of apples or winter squash. Multitasking decorations. It's the way to go. If you've never tried making your own pumpkin puree, I highly recommend it. The process is ridiculously easy and results in a pumpkin puree that is far fresher and more flavorful than anything you'll find in a can. 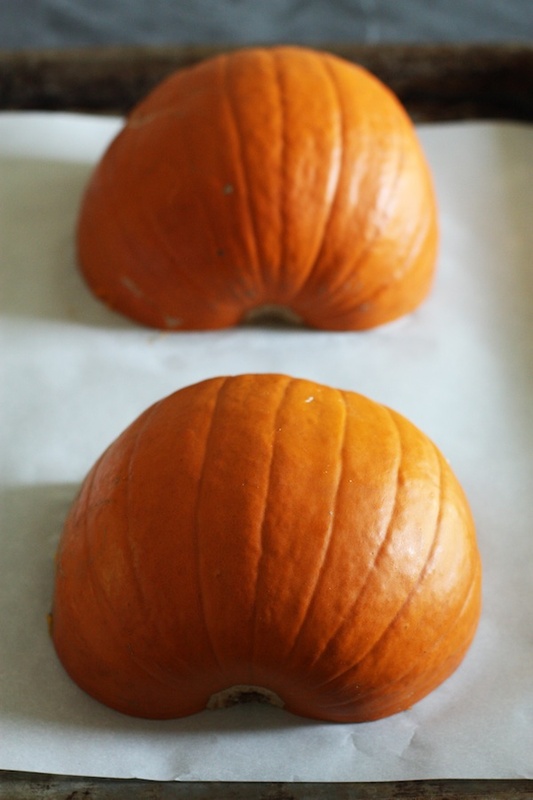 Here are the easy steps showing you how to roast a pumpkin and turn it into puree! It is much easier to cut the pumpkin in half if you get rid of the stem, so use a SUPER sharp knife and carefully cut off the 'lid'. Scoop out the stringy pulp and the seeds using an ice cream scoop or a large spoon. Save the seeds if you'd like to toast them, but discard the pulp. Preheat the oven to 350 degrees Fahrenheit and place the pumpkin halves, cut side down, on a parchment lined baking sheet. Bake for 45 minutes or until you can easily pierce the skin of the pumpkin with a fork or a toothpick. Let the pumpkin halves cool by setting the baking sheet on a wire rack. When they are cool enough to handle, use a spoon to scoop and scrape the flesh of the pumpkin out of the skin. Transfer the pumpkin flesh to a blender and pulse until smooth. If you end up with a dry pumpkin, add a tablespoon or two of water to the blender. I typically don't need to add any additional liquid and only do so if absolutely necessary so I can use the puree in baking recipes without any problems. And that's all there is to it! Easy. Oh so easy. You can use the puree in anything from pancakes to soup to a homemade pumpkin pie latte. I'll have more pumpkin recipes for you this week using this puree, so make some ASAP and get ready for some pumpkin deliciousness!